This entry was posted on September 2, 2014 at 10:41 am and is filed under Uncategorized with tags book, Ghost, haunted, History Press, kirkcaldy, Scotland, Spooky, supernatural, Waterstones. You can follow any responses to this entry through the RSS 2.0 feed. You can leave a response, or trackback from your own site. 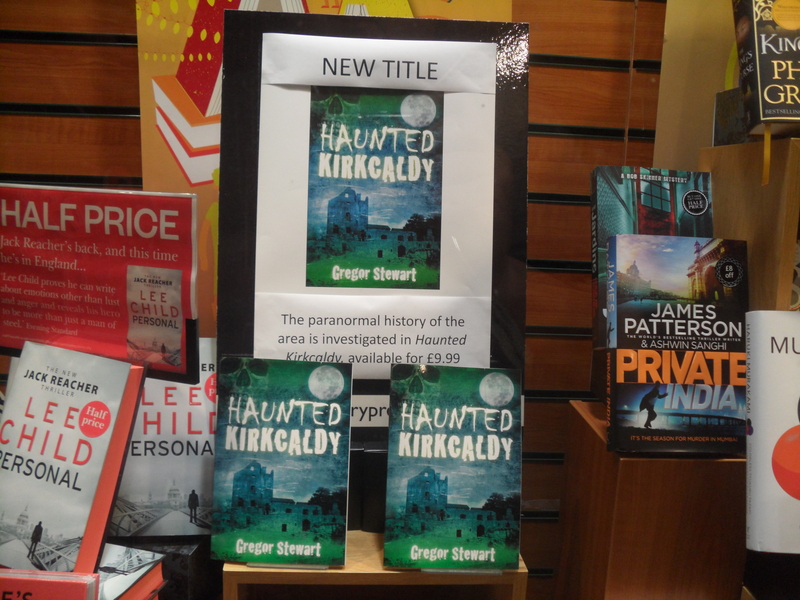 I’ve just finished reading Haunted Kirkcaldy which I bought for my daughter and I have to say it was a thoroughly good read! I was particularly interested in the story of the poltergeist in Oaktree Square as my family lived next door and through the wall to the house in question and I remember it vividly from when I was a boy. My parents spent a few nights in the house with the family at the time and my father, who didn’t believe in such things (although my mother did), was quite unnerved by it all! I know for a fact that such things exist. I’ve lived in my house in Kennoway for over 30 years and some of the things that have happened have been incredible, from objects disappearing for months and then suddenly re-appearing (sometimes in a different house!) or never being seen again, to bolted hooks on the wall inverting themselves with no apparent explanation to, most bizarre of all. shadow figures coming through the wall and racing around the house! I have no idea what it’s all about but it’s been going on for years and I’m convinced my daughter is the catalyst for it all. She recently produced a documentary about the Edinburgh murderers, Burke and Hare, much of it filmed in Greyfriars in Edinburgh and, I have to say, it’s one scary place, particularly at night! Thank you for your kind words, I’m glad you enjoyed the book. It is always good to hear about people’s personal experiences relating to the stories. I have covered the next stage of the Oak Tree Square poltergeist in my book Supernatural St Andrews and I am currently working on a book on the ghosts of Edinburgh, which does include Greyfriars Kirkyard. It would be difficult to write about Edinburgh without including Greyfriars and the Vaults!